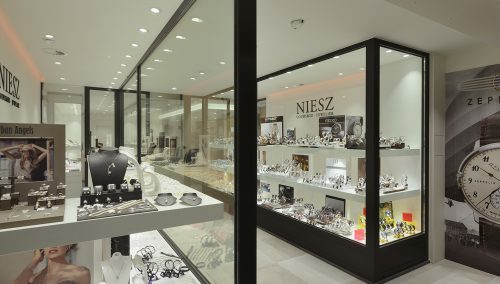 The Bigor jewellery store in the new Opkorn shopping centre in Differdange, Luxembourg was created on an area covering just 135 square metres. 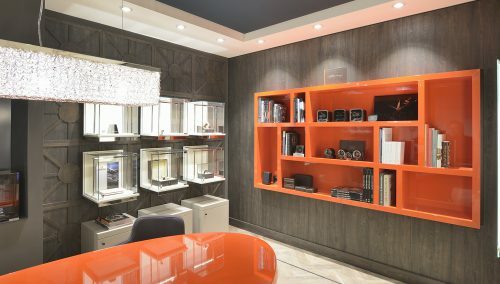 Though it may be small, it certainly packs a punch: the store has been a hit with its huge selection of lifestyle brands: the range includes Superdry, Hugo Boss, MelanO, Pandora, Guess, David Wellington, Maserati, Bering, Jaguar, Les Georgettes, Timberland, Michel Herbelin, Victorinox and many others. Each label is put in the spotlight. To make that possible, the store designed by the Dutch-German shop fitters WSB apparently consists only of display cases, so artfully matched that despite the small footprint, customers are presented with a shop that feels roomy. This is also due to the wide, double entrance which – separated only by a display case – draws visitors to the shopping centre directly into the store. Added to this, the impressive ceiling height of 5.5 metres removes any sense of constriction. All the walls can easily be reached by those who wander in for a casual look – first look with no obligation, then buy is the concept. In the centre there is a customer service island, above which modern globe lamps create a pleasant lounge atmosphere. Ingenious store concepts like this, worked out to the smallest detail, are no accident. WSB employs an internationally renowned team of architects who develop retail concepts for fashion, design, shoe shops, jewellers, opticians and other sectors. The shop fitters have delivered projects not only in their home country but also in Germany, Belgium, Luxembourg and France. Customers range from big fashion brands to individual entrepreneurs. Every creative challenge starts with an intensive dialogue with the customer, in order to define the correct retail marketing strategy. Who is the owner and what does he/she want to achieve? What is the store’s DNA? What sets the range apart? In the design phase, the individual profile of the business is worked out, before taking shape in the store interior. 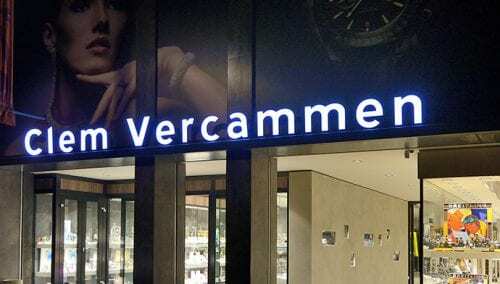 The result are stores that deliver maximum sales and earnings at the location.